Hearing that Mr. Jean-Claude Junker, EU Commission president, was to be the keynote speaker at the 200th anniversary celebration of Karl Marx’s birth revived my memories of researching political philosophies of the 19th Century. The heated discussions on the roles of Capitalism, the State & Religion, and the Individual in Society; the authoritarian aspects of Marxism as opposed to the more democratic elements of Anarchism. A major critic of Karl Marx’s thinking was Michael Bukunin. To quote K. J. Kenafick “The Marxian view was essentially that the State must be used to bring about and consolidate Socialism; the views of the Bakuninists (at this period beginning to be called “Anarchists”) was that the State must be abolished, and that it could never under any circumstances be used to obtain either Socialism or any form of social justice for the workers.” Whether State controls Society, or Society controls the State, or whether the State should only be local administrations or councils. Fear of the States’ Shock & Awe or winning the Hearts & Minds of Society – Top-down or Bottom-up – Centralisation or Subsidiarity politics. The despotic regimes of Marx/Bukinin times could be compared to Donald Trump’s USA: One ruler directing a few hundred lackies to control an empire, dividing Society into friends and foes; relying on threats, police and an army to enforce His Authority. Modern “Marxist” regimes (a few leading the masses) are Putin’s Russia, Xi’s China, or maybe wannabe McDonald‘s Sinn Fein “They haven’t gone away, ye know”. When the people are being beaten with a stick, they are not much happier if it is called “the People’s Stick”. 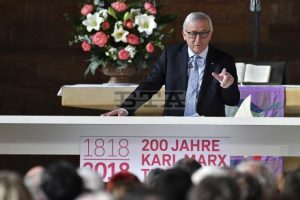 In some aspects the Commission of Mr Junker seems happier dealing with the State & Corporate elites than with the millions of questioning voices of Society, poorly represented by the EU Parliament, but the invite was probably from todays German political party, the Social Democratic Party of Germany (SPD). The world’s oldest Marxist political party founded as the General German Workers’ Association in 1863 in a world of absolute monarchies working hand in hand with Capitalists & Church, controlling press and justice, with the workers having no influence. The reaction of people in the “Yes/No” referendum seem to mirror these age-old arguments. The “No” voice is that of Authority, Control and Religion. The “Yes” voice is of Society, Reason and Choice. Life is living, life is changing! 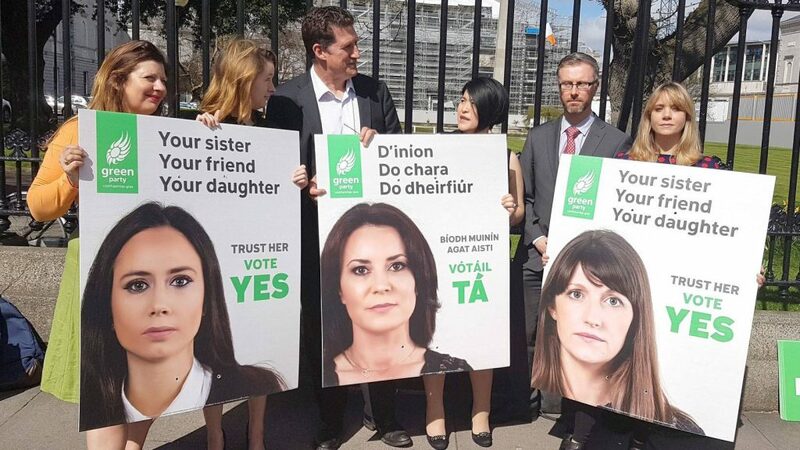 While I’m not wildly in favour of abortion, I would rather a doctor was party to the decision of my family, rather than a judge, lawyers, a dull line in a constitution and the shadow of a policeman at the door. I trust Society to do the best for Ireland, not the State, not the Church. My choice is to vote “Yes to Repeal the 8th”. (28/05/2018) Congratulations to Ailbhe Smyth, all the campaigners of ‘Together for Yes’, and especially our Green Party members for running a sucessful and informative campaign to repeal the Eigth Amendment. Ed & Oisin and the team for canvasing, leafleting, errecting & removing our posters – Well Done, guys! It was never about the 95% of happy births, Irish Society showed compassion by voting to help the 5% of problem pregnancies and the mothers’ health. The struggle to improve the life of every family through universal healthcare, safe homes and quality education will continue. This entry was posted in education, Green Politics, Uncategorized. Bookmark the permalink.